Mariano Rodríguez traveled to Mexico in 1936 where he studied the technique of fresco painting with artist Manuel Rodríguez Lozano and a group of Diego Rivera’s assistants. In 1937 he returned to Cuba and participated in the Havana Free Studio for Painters and Sculptors as an advisor of mural painting and adjunct professor. A year later he received an award for his oil painting Unidad (Unity) at the 2nd National Painting and Sculpture Exhibition. In 1939 he organized his first individual exhibition at the Havana Lyceum and painted the mural Educación sexual (Sexual Education) at the Teacher Training School of Santa Clara. He co-founded the literary and artistic magazine Espuela de plata (1939-1941) with José Lezama Lima, and illustrated Lezama’s novel Enemigo rumor (Enemy Rumor) in 1941. 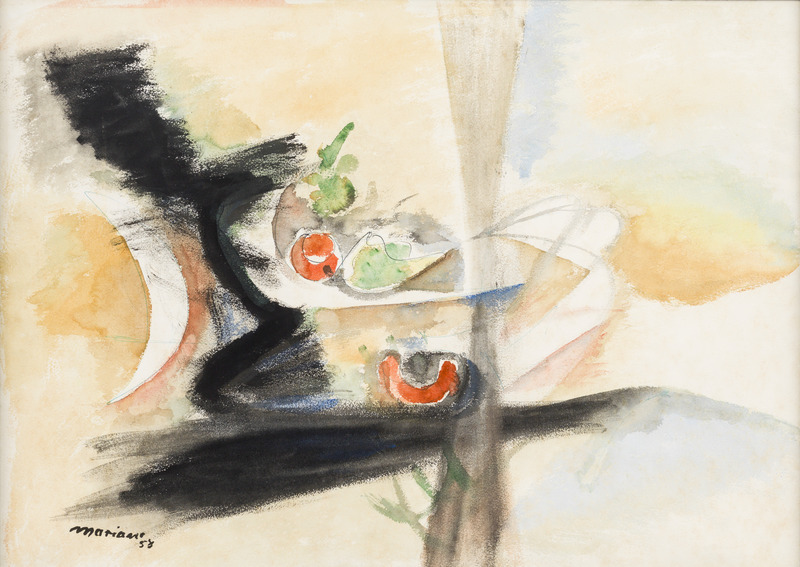 In 1944 he had another exhibition at the Lyceum and was features in the Modern Cuban Painters exhibition at the Museum of Modern Art in New York City. That year he began his prolonged collaboration with Orígenes magazine, including drafting its first cover. In 1952 he painted the mural for the Retiro Odontológico building in Havana. In 1960 he was appointed Cultural Attaché of the Cuban Embassy in India, where he made an important series of oil paintings and drawings. Back in Cuba, he was one of the founders of the National Union of Cuban Writers and Artists (UNEAC) and head of its Visual Arts Section. In 1962 he was appointed director of the Visual Art Department of Casa de las Americas, and served as President of the institution from 1980 to 1982. From 1982 on, he devoted himself exclusively to painting. In 1975 the National Museum of Fine Arts organized the most complete retrospective exhibition of his works. Abstracción (Abstraction), 1958. Gouache and ink on paper. 22 x 31 in.